Something stirs in the shadows. Quietly working away at old school prefix-free heavy metal since 2008, Washington’s A Sound of Thunder have steadily been rising in popularity and further sharpening their talents in the looming shadow of bigger name bands. Their earlier efforts showed them gradually sharpening an interesting formula that mixes the Uriah Heep/Rainbow/Deep Purple sort of highly melodic crunching half-metal with the more energetic, sky-shooting tendencies of the NWOBHM and other early pioneering movements they inspired, topped off with a soaring vocal performance and fluid delivery akin to the power metal of today. Come 2014 and they dove into the realms of the occult and the mystical with the excellent The Lesser Key of Solomon, which while a little inconsistent showcased them at their most solid. Already having gained considerable traction on Kickstarter, A Sound of Thunder now bring the main course. Not only is Tales from the Deadside both an enthralling story regardless of whether or not one is familiar with the Shadowman series of comics, it’s their strongest yet and a diverse journey through metal’s past with the brightest minds thrusting honed blades towards the future, bleeding a vibrant new life into supposedly “dated” sounds. In practically every way, the band has upgraded from the very tracklisting and production down to the particulars of composition and the enviable vocals of Nina Osgueda. They might not have the same established reputation as Portrait, RAM, Steelwing, Visigoth, Zuul, Trial, Sinister Realm, or Enforcer but it’s high time they join them and conquer as they do. So what makes A Sound of Thunder’s sound work so well? As shown earlier they sit in the middle of a Bermuda triangle between the classic era of traditional metal, its present day form, and the strange time when it was slowly evolving from the primal murk of hard rock. This manifests in diverse songwriting with elements both up to date and ancient sharing the stage equally. The smooth single string speed picking runs and staccato gallops of later bands isn’t common but the bluesier side of the genre, missing in action throughout the realms of metal save for doom, pops up frequently in many of the leads and rhythms that update almost 70’s Judas Priest style riffs with the melodic upgrades of later power and trad metal acts. The band however avoids the jammier raise-your-lighter approach in exchange for vigorous force, with Nina Osgueda’s powerful banshee tone and smooth timbre leading the way over meaty riffs that manage to groove without falling into assembly line fistpump patterns or bro-core bounce-thud segments. There are moments that outright venture into doom metal territory but the band focus less on an oppressive, ambient sense of density associated with is as much as a spirited and energetic delivery, choosing narrative direction over swamping mood. The opener, “Children of the Dark” captures this interesting balance well. After the spoken word piece that sets the scene, a death-kneel riff lumbers in. Then Nina’s voice dances with an alternating set of carefully paused lead riffs, breaking off into loose airier chords to match surges in her power or matching her snaking, serpentine lines with those same crushing riffs from earlier. “Deadside” confidently swaggers in like Pentagram’s “Be Forewarned” with suggestive, curious clean notes before a massive Sabbath-esque riff descends like the shadow of a massive winged predator. It throws a nice switch-up with the fast pentatonic riff that starts off a small chase-scene fast break with an awesomely rollicking riff before an aggressive solo cuts like an intercepting attack helicopter to seal the deal. On that note, the semi speed metal number “Tower of Souls” kicks up the tempo for a sinister King Diamond-esque attack, building up tension with a streamlined quick picked riff caped off with carefully timed downstrokes against a desperate yet charismatic vocal performance, featuring her most relentless and shrieking vocal lines on the album, throwing in demonic gang-screams and careful synth notes to accentuate the frenetic mood. Weirdo “Punk Mambo” blasts out of nowhere with Nina sounding like a one woman circus act portraying at least four different characters all the while the rest of the band goes hog-wild with the fastest, loosest playing on the album… and a saxophone solo? It works, somehow! The album ends on an ominous note with the one two punch of “Tremble” and then “End Times”, the former being a ruthless imperial march of Rainbow/Dio-esque stomping chords while the latter combines that with the grim grandeur of epic doom like Sweden’s Candlemass and Sorcerer. Mounting momentum with each successive riff like building blocks of pure damnation and dread, it hints at a prog element we may hear in successive albums as it rises from the catacombic depths, over a perilous bridge where the singing reaches a fever pitch, before being caught in a whipping tornado of fretboard pyrotechnics, the prelude to one last heroic cavalry charge. Don’t think this story ends on a happy note; as the narration illustrates Jack’s acts of the unspeakable, the same dirge-chords from earlier return and drag the listener back to the same hungering hells he’d seen just a few minutes earlier. It’s by far their strongest moment and hopefully indicative of future epic length tracks why will produce. Seven years have paid off well with not only A Sound of Thunder’s current artistic peak but an incredibly well realized sound. Any fervent worshiper of metal’s gods, both of the past and of pre-history, will recognize and love much of what is presented. However like the elite of the revival metal movements across all the genres, A Sound of Thunder does not worship but reinterprets and rearms time-honed weaponry for the titanic wars of the future. While there are more bands reimagining the idea of “old school” than many would have one believe, it’s not often you get one band like A Sound of Thunder that doesn’t just explore a lost golden age but also the forces that preceded it. If there’s a shortcoming here it’s that I would’ve wanted more fast, aggressive tracks as they do metal at those tempos as well as the best of them. I’d also like to hear them explore the more progressive metal elements they hint at with the final track, which offer a lot of versatility in terms of songwriting. However these are at best minor scratches on the armour of supremacy which A Sound of Thunder wears with pride. 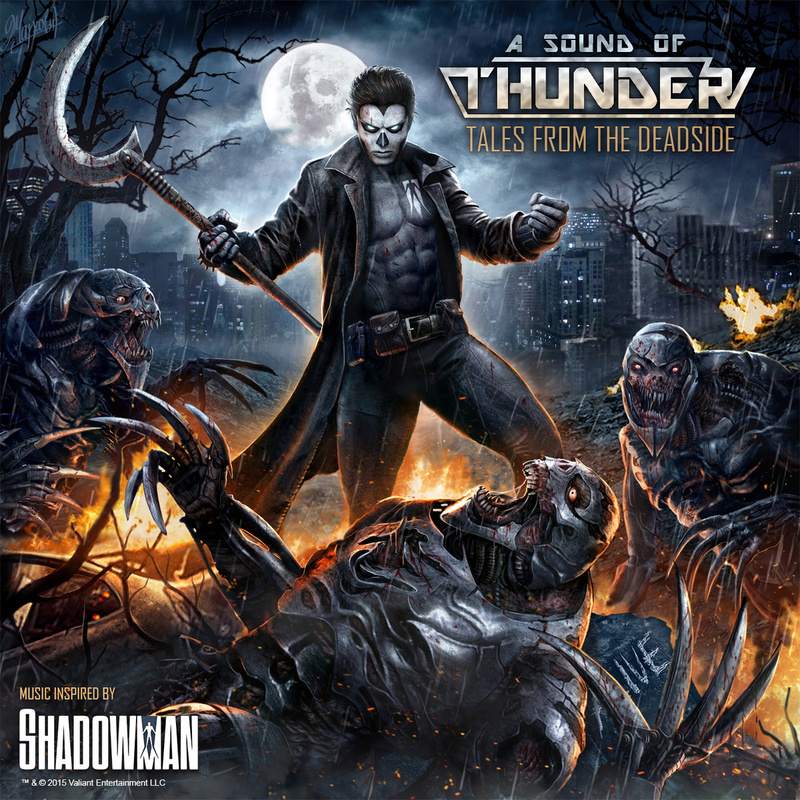 Regardless of whether or not you are familiar with or completely alien to classic metal both old and new, A Sound of Thunder will find something to suit your tastes one way or the other. This entry was posted in Featured Review, Reviews and tagged A Sound of Thunder, doom metal, featured, hard rock, Heavy Metal, old school, power metal, progressive metal.